The warm days of summer are coming to an end and the nights are getting steadily cooler. As the weather shifts into an autumn chill, most people find themselves enjoying their hot tubs on a more frequent basis. Now is a great time to prepare your spa for fall usage. Following the simple steps below will ensure you get the most out of your hot tub this season! Always start your hot tub draining procedure by shutting off the heater and powering off the spa, then switching off the power service at the breaker panel or disconnect box for safety. Tip: Prior to shutting off power, check the GFCI to ensure that it is functioning properly. To do this, press the “test” button. Once the power is shut off to your tub, you can resume your normal draining routine. For more in-depth information about how and when to drain your spa, check-out this great article on Draining Your Hot Tub. Before refilling your spa, take time to wipe down the shell with a rag and gentle non-foaming cleanser. 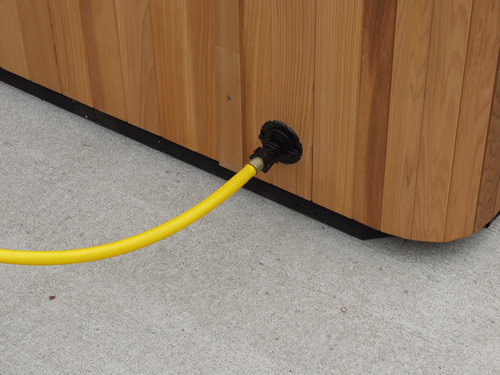 This will remove the remaining contaminants and help you to start your hot tub with cleaner clearer water. If you have well water or live in an area with hard water, consider using a hose-end pre-filter to filter out excess minerals and other small particles before they enter the spa. A pre-filter can also prevent hard-to-remove water line stains and scale build-up on the equipment. Apply gentle non-abrasive oil free cleaner on a rag or soft sponge. Read more about Proper Spa Cover Care. Your spa doesn’t have to cost more during the winter! Adding an insulating ThermoFloat spa blanket can reduce heat loss due to evaporation by up to 95%. These blankets provide a layer of insulation in addition to your hot tub cover. The blanket lies directly on top of the water, preventing evaporation and protecting your spa cover at the same time. Now that your hot tub is clean and ready for Fall, it’s time to enjoy it! Have questions about hot tub maintenance? Post a comment below and receive free advice from our experts! just moved my tub and did not put the one inch cement blocks back under the middle. only around the outside edge/ will it hurt to not have the center support in the middle. it has been on the blocks for years, but had a few under the center. can I just jack up the side and slide them under. to heavy for two old people to lift. thanks. We recently purchased a new hot tub set to be delivered this week! We have well water high in iron and sulfur (both of which stain quickly and have a horrible smell) We currently run our water through a pre filter than water softner than an ozone filter system. Just curious what our best option is for filling the hot tub! Can”t wait to enjoy it! Very seldom do I see an important article that is both enlightening and pleasurable, and without a doubt, you”ve hit the nail on the head.